Teen Top is a South Korean boy band that consists of six members: C.A.P, Chunji, L.Joe, Niel, Ricky and Changjo. The band debuted under TOP Media, founded by Andy Lee of Shinhwa, in 2010. They released their first single album Come into the World on July 9, 2010 and made their official debut the following day on MBC’s Music Core. Their official fan club name is Angel, previously unofficially named Andromeda. Teen Top members Ricky and Niel were both child actors. Niel debuted through the musical ‘Please’, where he played the younger version of Joo Won’s role. Ricky debuted in Seo Taiji’s music video for ‘Human Dream’ and later portrayed the young version of Song Seung-heon’s character in ‘Love Song’. Four of Teen Top’s Members such as Changjo, Niel, Cap, and L.Joe had an open Lotte World audition whereas the other members (Chunji and Ricky) had a closed audition. It took L.Joe two auditions before he could train unlike the other members. On 22 and 23 February, Teen Top held their ‘TEEN TOP 2014 World Tour HIGH KICK in SEOUL’ concert in Seoul’s Olympic Hall. They then proceeded with their “HIGH KICK” World Tour in various countries such as Canada, China, Hong Kong, Japan, Russia, Taiwan and South American countries like Colombia, Chile, Mexico, Panama and Peru. Recently they released a new album titled ‘Red Point’ and planned to have their 2nd solo concert tour in the US. 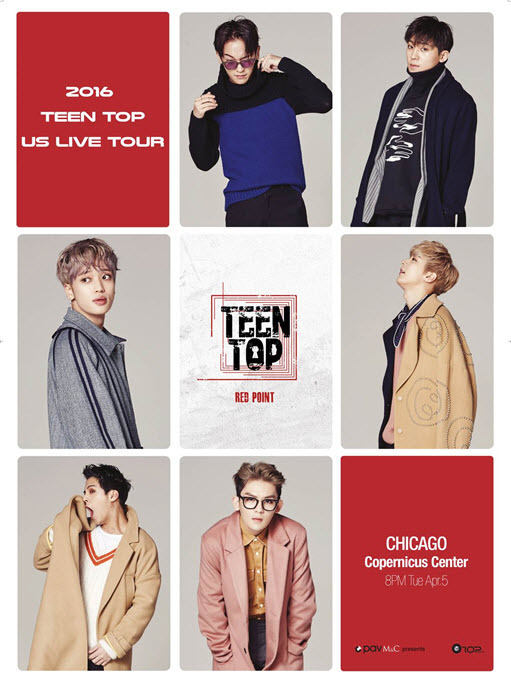 Studio PAV M & C, as the sole promoter based in NYC, presents ‘2016 Teen Top US Live Tour’ for the fans called ‘Angel’ in the US, starting from New York City on April 2, Chicago on April 5, Dallas on April 8 and Los Angeles on April 10. This show at Copernicus Center is the first show in the area so they are excited to meet the fans in Chicago.